Once upon a time, in the mystical land of Singapore, there was a girl called Marina who decided that it could be a good idea to go to the museum during Christmas. Museums in Singapore had free entry you see, during the holidays. Moreover, she had a lot of fun there the last time she was there treasure hunting! And so she headed there with her husband Cart, her brother Haikal, and her sister Diana. And they all had fun together looking at the Pompeii exhibit which was currently running as well as exploring the other permanent segments like retro clothing fashion and traditional street food. Marina was sad reading about the possible re-enactments of how the locals from Pompeii died from the eruption of Vesuvius. Especially the tale of the chained dog who tried to save himself but couldn’t. But soon she was enjoying herself looking through the rest of the exhibits. She remembered that her mother had exactly the same sewing machine such as this one. And was nostalgic about the rhythm of the sewing machine as her mother worked. The national museum is an interesting place. It looked quite European Renaissance, probably due to Singapore previously being a British colonization. Marina admired the swinging lights at the end of this path. “It looked very Lara Croft like!”, She thought to herself. Marina admired this satay street food. It was very convenient! All one had to do was to wave at the Satay seller and he will walk all the way up to you and cook right in front of you. And in no time, you’d have a plate of freshly cooked satay! And there were a couple of outfits that she wouldn’t mind wearing outside on a dare. At the end of the tour, Marina feet very contented that she had a very educational evening. The rest seemed to enjoy themselves too. But it was starting to get dark. Dinner time! It was now time to eat! The four of them were very hungry. “Ah! Since we are in the area, lets walk to Beach Road to eat at Ayam Penyet House!”, she suggested. 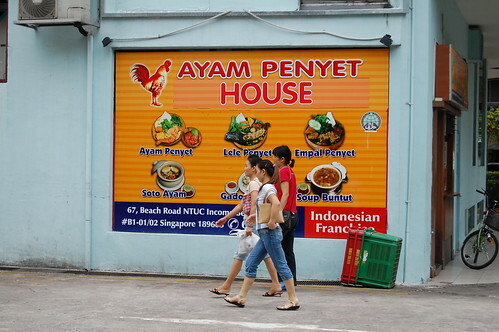 Ayam Penyet House was her favourite place to eat Ayam Penyet. And she had been waiting for one entire year to eat here. All the rest agreed to go. And so they walked. And they walked. And they walked. Till at length, she finally saw the building and she was filled with happy thoughts of eating her favourite food. But how odd. Where is the banner? Why are there no lights? Her curiosity became bigger when she reached the door. It looked completely different and to her horror, she found it locked! Her favourite Ayam Penyet restaurant has closed down! Marina was very sad and visibly upset. And for a full 10 minutes, she was in a state of denial. Pulling and then pushing the door, trying to open it and have someone serve her, her beloved Ayam Penyet. Could it be that their business failed because she was not there? One customer could have made the difference. The one extra dollar that made or break a business. Nevertheless, after moping for a while, she then remembered that there was a place that she used to go to for Chicken Rice. For her, it was her favourite Chicken Rice place in Singapore. And while eating it, it tasted just as good as she remembered. It wasn’t Ayam Penyet. But it was delicious enough to placate her depression. I also have that sewing machine in my house. In fact, it’s still functional and my auntie still uses it sometimes to make little mends. And yes, there are loads of people who says that the Sri Bistari food center at Changi Village is good. I didnt have a chance to go there though. I didn’t really had anyone who was willing to travel with me there! Food center at Changi Village is quite nice. But I almost always skipped it because I pass through Changi Village on my way to Pulau Ubin and I always eat on this island. Next time I will eat there and try ayam penyet. Everyone said that Changi Village Ayam Penyet is good. Why wasn’t there anyone who would accompany me there while I was in Singapore?! Hope you enjoyed the visit to the National Museum. I liked the Pompeii exhibition very much too. In fact, I’ve seen it twice – once in Melbourne and once here. I enjoyed the pompeii exhibition by the way, we were very lucky to catch it on display! Cart even said that there were more artefacts here than in Pompeii in Italy due to the governance here … which is sad. OMG that’s my fave ayam penyet place too, I was so sad when I found out they closed :/ I thought they were doing well, the place was always crowded. Anyway, I’ve tried the one at Changi Village and it doesn’t live up to Ayam Penyet House to be honest. The sambal doesn’t have that kick! Previous PostPrevious The things I do to see the sunrise at Gianicolo. Next PostNext I love Cameron Highlands!